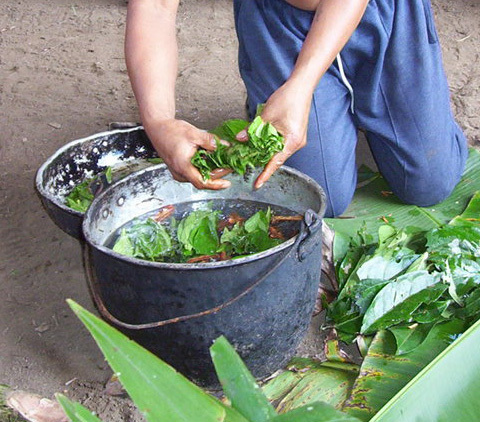 Ayahuasca being prepared, Río Napo, Peru. Attribution: HEAH, CC Attribution-Share Alike 3.0 license. A fascinating debate has erupted concerning the use and proposed regulation of the Amazonian hallucinogen ayahuasca (Banisteriopsis caapi, sometimes supplemented by other plant substances). As explained in Upriver, consumption of ayahuasca was once an integral part of individual spiritual development among the Awajún, and its use may be undergoing a revival despite the Awajún’s significant rate of conversion to Christianity. Although the ESC website emphasizes the importance of dialogue, the ESC provides scant evidence that it has consulted extensively with the indigenous peoples who are the original stewards of this ancient healing plant. The ESC proposals have sparked a skeptical response from a distinguished group of anthropologists with long experience working among Amazonian peoples. The skeptics’ rhetoric may be heavy-handed, but it makes a crucial point. Although one may applaud the ESC’s declared commitment to environmental protection and the safety of those drawn to the use of ayahuasca and related entheogens, the organization seems to take for granted (1) that a group of professionals drawn mostly from the developed North is empowered to develop rules about the use of traditional indigenous plant medicines by people in the developing South, and (2) that the “problem” of ayahuasca–if there is one–can be solved by developing formal regulations that appear to be designed primarily to accommodate the growing number of vision-seeking, fee-paying spiritual tourists from the North. Which makes one wonder whether the problem is tourism itself rather than the activities of the sometimes disreputable ayahuasca shamans who have set up shop to serve affluent spiritual seekers. Read the documents and draw your own conclusions!